It's the same the world over. A Hollywood production comes to town, and the locals all turn movie crazy. When a little picture named "Prancer" came to Three Oaks, Mich., I was sitting in the bar and overheard one bearded regular confide in his friend, "See that guy? He's assistant makeup." As in Michigan, so in Iran. At the height of the 1979 Iranian hostage crisis, with yellow ribbons tied around half the old oak trees in America, a CIA agent and a couple of Hollywood professionals dreamed up a cockamamie scheme to free six Americans who had found refuge in the Canadian embassy. Their existence had to remain a secret to protect Canada's diplomatic status. Enter the CIA "extractor" Tony Mendez (Ben Affleck), a producer named Lester Siegel (Alan Arkin) and a makeup man named John Chambers (John Goodman). Chambers has a brainstorm: He and Siegel would fabricate a fake sci-fi thriller named "Argo." They would commission a screenplay, pay for storyboards, and buy a big ad in Variety. Mendez would fly alone into Tehran and train the six Americans to impersonate Hollywood pros — the cinematographer and so on. Their cover: They need desert locations for their movie, which would vaguely resemble "Star Wars." They would tell the Iranians the six people were Canadians who were scouting locations and now need to fly back to North America. One of the most enchanting scenes has Mendez showing the sci-fi storyboards to Iranian authorities, who try their best to conceal what movie buffs they are. At the end of the scene, when Mendez tells them "you can keep em," they're like kids being given an "E.T." poster by Steven Spielberg. This preposterous scheme is based on fact. Yes, it is. Countless movies are "inspired by real events," but this one truly took place. The extraction of the six Americans remained top secret for 18 years. They all returned safely to America. "Argo," needless to say, was never filmed. 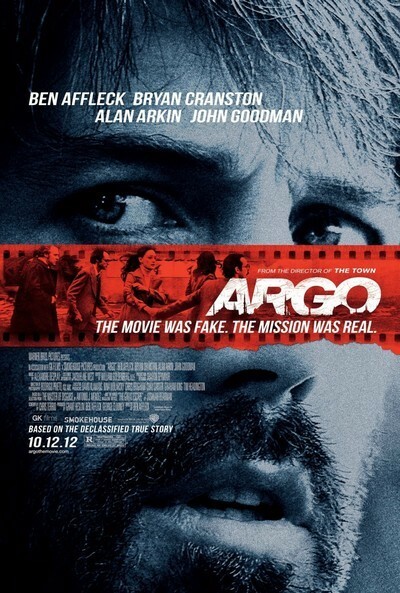 Ben Affleck not only stars in but also directs, and "Argo," the real movie about the fake movie, is both spellbinding and surprisingly funny. Many of the laughs come from the Hollywood guys played by Goodman and Arkin, although to be sure, as they set up a fake production office and hold meetings poolside at the Beverly Hills Hotel, they aren't in danger like their "crew members" in Iran. Key supporting roles are filled by Bryan Cranston, as the CIA chief who green-lights the scheme, and Victor Garber, as the Canadian ambassador who at great risk opens his embassy's doors to the secret guests. Affleck is brilliant at choreographing the step-by-step risks that the team take in exiting Tehran, and "Argo" has cliff-hanging moments when the whole delicate plan seems likely to split at the seams. The craft in this film is rare. It is so easy to manufacture a thriller from chases and gunfire, and so very hard to fine-tune it out of exquisite timing and a plot that's so clear to us we wonder why it isn't obvious to the Iranians. After all, who in their right mind would believe a space opera was being filmed in Iran during the hostage crisis? Just about everyone, it turns out. Hooray for Hollywood.